Leave a message for our team? You can expect your package to arrive 5-10 business days after the time expires (only regarding mainland France shipping). By clicking on "Validate order", I accept the general terms and conditions of sale. Paypal shipping address has not been communicated. The products of the same order can not be packaged individually. Only one gift package per order is possible. Gift box not provided for products with exceptional size (not corresponding to any of the available packaging formats). You can leave your message in the package by leaving a few words in the intended location (below the 'Gift Wrap' selection). It will be printed on a nice gift card. 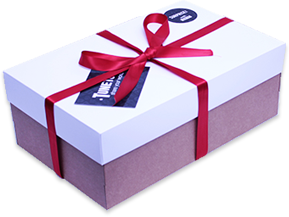 To make your present even more beautiful, Tunetoo has created a gift box with surprises. The most suitable packaging for the size of the products of your order (box or pouch) will be used. If no gift packaging is selected, your products will be packaged in a bag or shipping carton.